FINAL SALE. The awesome open knit design pattern of this dress reminds us of an expensive Missoni designer dress--get a similar look for less! 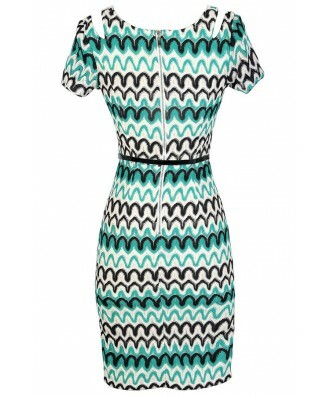 The Wave Pattern Open Shoulder Knit Dress is fully lined and made of a wave patterned knit we love. It has a rounded neckline and cutout design at the shoulder. The classic fitted pencil cut will hug your curves. An included belt wraps around the waist and ties the whole look together, and an exposed back zipper completes this dress. 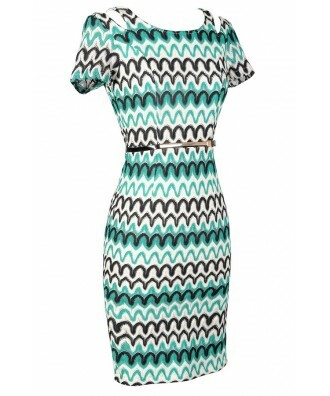 The Wave Pattern Open Shoulder Knit Dress would look nice dressed up with pumps or heels. You could also wear it more casually with wedges or flat sandals and an oversized bag. Toss a fitted jacket over this dress on cool evenings. This is a great dress to pack on vacation because it is wrinkle resistant and can be dressed up or down. Details: Fully lined. Exposed back zipper. Belt included. 100% polyester. Hand wash cold with like colors. Do not bleach. Low iron. Small measurements: Length from top of shoulder to hemline: 37". Bust: 32". You have added Wave Pattern Open Shoulder Knit Dress in Green/Black into Wishlist. You have added Wave Pattern Open Shoulder Knit Dress in Green/Black for Stock Notification. You have set Wave Pattern Open Shoulder Knit Dress in Green/Black as a loved product. You have removed Wave Pattern Open Shoulder Knit Dress in Green/Black as a loved product.